His smile is as strong as his voice. Is he a man, or a musical firehouse between northern icebergs? Actor, songwriter and folk singer Rasmus Lyberth (62), the Greenlandic legend, who conquered the Royal Albert Hall in London (2011) and the J.F. Kennedy Centre in Washington (2013), embodies the elements of the Arctic landscape with his performances, that are as commanding, natural and rough as life on ice. Dramatic, yet at the same time beautiful and purifying. He never learned English nor does he sing in English, he only speaks Greenlandic and Danish. Rasmus Lyberth cherishes the Greenlandic language. He doesn't feel the need to sing in English to reach bigger audiences. Rasmus: "I feel very privileged to sing in Greenlandic. There are millions of singers who sing in English, but there are a few who sing in Greenlandic." But while composing and singing in his mother tongue, he seems to reach audiences all over the world and conquers any stage, anywhere. He has the unique ability to transcend language barriers and convey the drama and beauty of the Greenlandic culture to his audience. Rasmus Lyberth: The Voice of Greenland. In the summer of 2011 Rasmus Lyberth received an invitation from the BBC to perform at the prestigious Royal Albert Hall in London as part of "The Proms". The show was recorded by the BBC and broadcasted directly on BBC Radio 4 and later on television in many countries. Rasmus Lyberth's voice opens up the whole Arctic culture to everybody. It has been said that: "When Rasmus sings, it gives you almost a supernatural feeling inside. Something spiritual and transcendental happens." Rasmus Lyberth, who writes his own songs and composes his own music without being able to read music, touches the souls of his audiences. The Greenlandic folk singer goes his own musical way. He was knighted by the Danish Queen, Margrethe II, and several times he has been asked by the Danish Court to perform when the Queen went on royal visits abroad. Being one of Greenland's most popular musicians, he has performed over the years in Mexico, USA, Bolivia, Canada and most European countries, exposing people's hearts to an unfamilair soundscape. And, most honourably, he received an invitation to perform in Copenhagen on Sunday 8 December at a memorial service for Nelson Mandela. Sailor, engineer. Guitar player, pianist, actor, singer, songwriter and composer. Multi-talented Rasmus Ole Lyberth has been a sailor and an engineer in his younger years, but he was trained as an actor and had leading parts in films. His acting performance in the film "Heart of Lights" gave him a nomination for a Bodil, which is the highest Danish film award. At the age of 13 he started playing the guitar and later he learned to play the piano. He is completely self-taught and never took any lessons. Gradually he started a musical career at the age of 19. In 1969 he started performing as a musician in Copenhagen. In 1974 he recorded his first album Erningaa. When this album proved to be successful, a second album came out a few years later, after which he had a few years of musical break. Later he performed on the stage of the Greenlandic Tuukaq Teatret. For his musical achievements he received several prizes, such as the Danish PH (Poul Henningsen) Prize, The Danish Jazz, Beat and Folk Prize, and the prestigious Nordic Council's Medal of Honour. Rasmus Lyberth performs with his band, which consists of Kristoffer Jul Reenberg (piano and organ), Jane Clark (violin) and Christian Søgård (accordion). 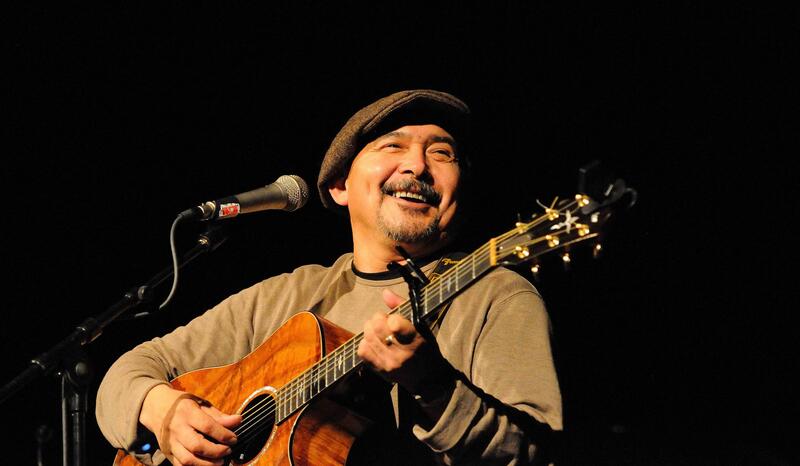 Two of his biggest musical successes are the songs "Asanaqigavit" and "Inuuneq Oqalyttuartaraanngat" (2008), on an album of which 50,000 copies have been sold, and for which he received a golden record. Other impressive songs of Rasmus Lyberth are: "Ajajajaa", "Kuussuup Sinaami", "Ullorissat Ungataanni", and "Inuuneq Nutaaq". Rasmus Lyberth is still acting these days, but not as much as he is singing. He has four children and currently lives with his wife Annette in Odense (Denmark). Song about the eagle - Symbol of wisdom: "Close your eyes and fly away"
Greenland is the world's biggest island and has about 60,000 inhabitants. Currently, Greenland's ice cap (Indlandsis) covers about 80 percent of the island, restricting human activity largely to the coasts. The island, famous for its tall icebergs, its impressive glaciers and sledge huntings, has no roads, since it is largely covered with ice. That's why Greenlandic people travel by snow scooters, helicopters, dog sledges or sail boats (in the south, when there is no ice). Greenland has historical ties with Norway and Denmark, and although being a geographical part of North-America, the country is politically and culturally associated with Europe. The history of Greenland is a history of life under extreme Arctic conditions and survival has been tremendously dififcult over the years. Rasmus Lyberth belongs to the Inuit culture. The first humans that are thought to have arrived in Greenland were Inuit, aboriginal people who arrived in Greenland via Alaska some 5000 years ago in the Stone Age. Their descendants apparently died out and were succeeded by several other groups migrating from continental North America. 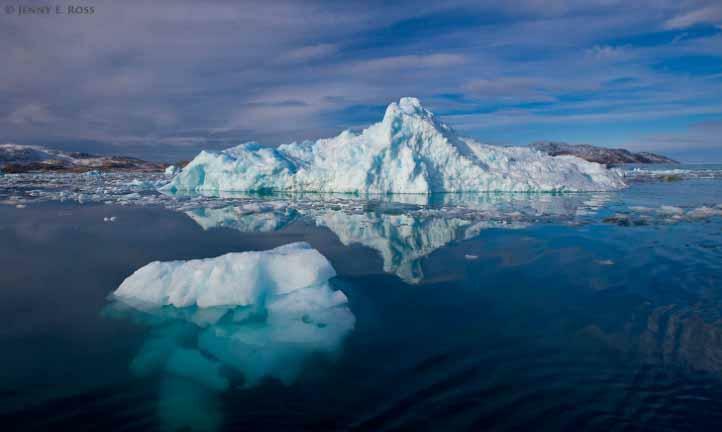 There is no evidence that Greenland was known to Europeans until the 10th century, when Icelandic Vikings settled on its southwestern coast, which seems to have been uninhabited when they arrived. According to the sagas it was actually Eric the Red (Erik Thorvaldsson 950 - c. 1003) who called this country Greenland. When Erik the Red set foot in Greenland, he did not realize that 85 % of the island was covered with ice. Because of the gentle climate and the fertile soil which made it suitable for agriculture, he called the country Greenland. After he had lived for three years in this region he returned to Iceland, and wanted to convince his fellow countrymen of the fine opportunities for starting a new life here in this 'Green Land'. The appellation 'the Red' most likely refers to his hair colour and the colour of his beard. The ancestors of the Inuit Greenlanders who live there today appear to have migrated there later, around 1200 CE, from northwestern Greenland. While the Inuit survived in the icy world of the Little Ice Age, the early Norse settlements along the southwestern coast disappeared, leaving the Inuit as the only inhabitants of the island for several centuries. During this time, Denmark-Norway continued to claim sovereignty over the island. Later Denmark-Norway developed trading colonies along the coast and imposed a trade monopoly and other colonial privileges on the area. In 1814 Greenland became a Danish colony. When the Constitution of Denmark was estasblished (1953) Greenland became a part of the Kingdom of Denmark. In 1979 Greenland became autonomous, after Denmark has given it self-government. A non-binding referendum on Greenland's autonomy was held on 25 November 2008. The proposals were to expand home rule in 30 areas, including police, courts, and the coast guard, give Greenland a say in foreign policy and a more definite split of future oil revenue, and make Greenlandic the sole official language. Under the proposal, Greenland's subsidies from Copenhagen would be phased out. The subsidy is currently 3.5 billion kroner per year. The referendum passed and the results took effect on 21 June 2009, the 30th anniversary of the establishment of home rule. The Greenlandic government has stated that this was a "major step towards independence". When enacted, the referendum will give Greenland control of the police force, coastguard and courts. In addition, Greenlandic will become the sole official language. The Inuits have managed to live and survive in the harsh Pole climate of the Arctic world for generations. For centuries they lived in special turf dwellings; the last Greenlanders moved out of their turf houses and into modern cabins and houses in the mid-1950s. Since the first wave of immigration via Thule around 4-5000 years ago, the Inuits in Greenland have been dependent on nature's resources in the form of fish, birds, land mammals and marine mammals. Hunting and fishing have therefore always been a question of survival in a country in which the summer is short and the climate unsuitable for farming, with the exception of South Greenland, where sheep farming was practised. The Inuits had to utilise their ancestor's skills, their own imagination and the materials that were available in the landscape around them to make the tools that could mean the difference between life and death. Throughout generations, the Inuit cultures managed to create and refine unique products such as the kayak, the women's knife known as the ulo, the soapstone lamp and harpoons, bird spears and high-quality clothing made of animal hide and fur. They even used compacted snow to build a temporary shelter in the form of an igloo. 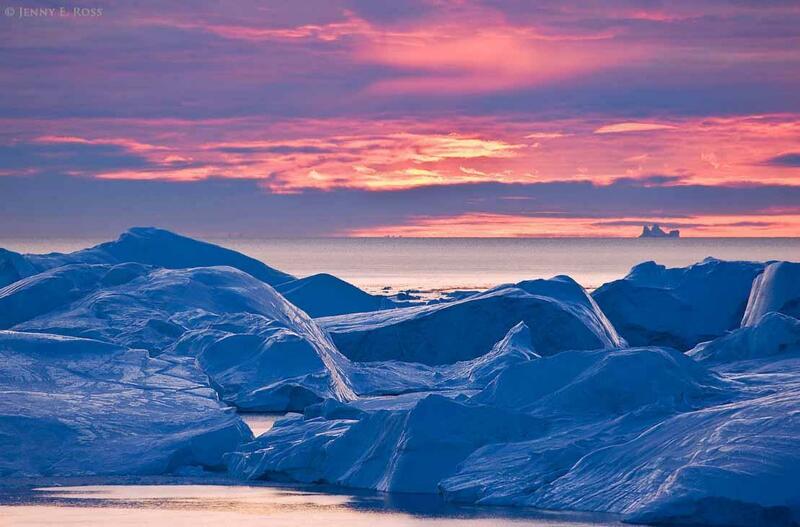 The main dialect, Kalaallisut or West Greenlandic, has been the official language of Greenland. Greenlandic is a polysynthetic language that allows the creation of long words by stringing together roots, one or more affixes and a suffix. This means that sentences and thoughts can be expressed with one word. For example a potato in Greenlandic is called 'naatsiiat', which means 'something for which one waits for a long time to grow up'. The Kalaallisut language has been written in Latin script since Danish colonization began in the 1700s. The first orthography was developed by Samuel Kleinschmidt in 1851. An extensive orthographic reform, undertaken in 1973, made the script easier to learn and resulted in a boost in Greenlandic literacy.